We're a young family figuring out if we can travel the country with our kids and pug. One small dog, a pug. 27' trailer w/ a slideout and a small dog. I'm towing with a 2010 Nissan Pathfinder SUV. 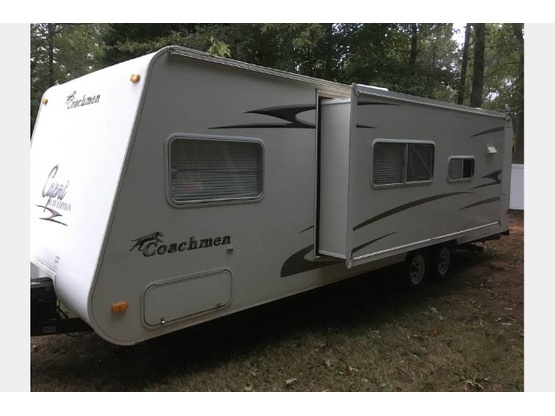 We're renting it so we don't have a picture to share, but it's a 2005 Coachmen Capri. Family fun and travel experiences. 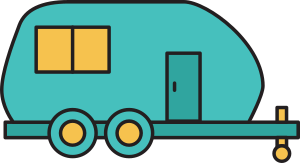 Friendly and caring family new to RV living while dad works on the road. Shared experiences around the fire pit making S'mores and hot dogs. Lots of places to explore for the famy locally. This was our first time hosting young children. Although well behaved they were curious and wanted to explore areas where we had race equipment, other boondockers, pets, pool and fire pit. Not bad but Had to be watchful and cautious when Emily had to take baby into RV that left 4 and 5 year old outside with out parent supervision. The teacher in me had toys and chalk to keep occupied in designated area. This was our realization to do more "child proofing" of our property. Nothing bad happened but a camping learning experience for us all.